I’m all for making baby projects, especially since my kiddos are past the stage of needing them. Since having the triplets, I no longer get baby fever. I’m fairly certain that they removed whatever causes that when they did the c-section. But I love to craft and sew, and we all know that baby projects are the CUTEST! Right? So I always get excited whenever a friend or family member has a new baby. Time to pull out the sewing machine! 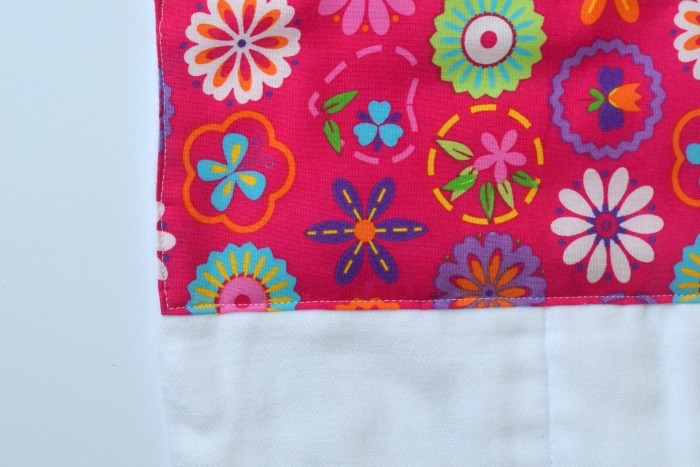 This past week, I worked on a set of three boutique style baby burp cloths. Each one is different, yet they are all quite easy. If you are a beginner with the sewing machine, then this is a good project to get your feet wet. 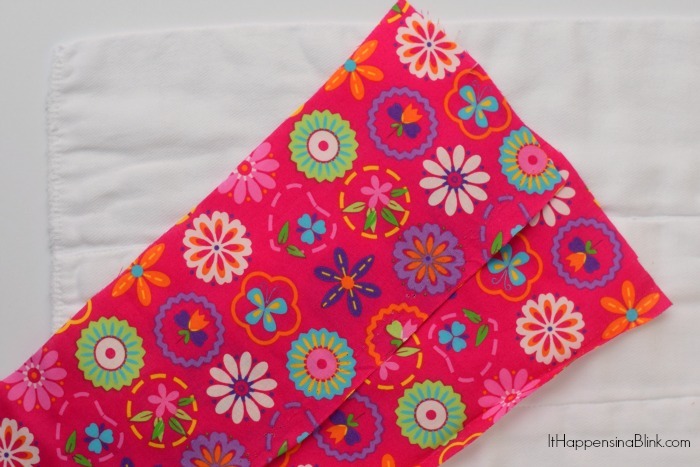 For this burp cloth, the patterned material will be horizontal along the short portion of the burp cloth. There will be one piece of material on each end. Figure out how much material that you want on the end of the cloth. I cut mine approximately (5 inches) times the (width of the cloth plus 1/2″). Cut two pieces of material in the same dimensions. 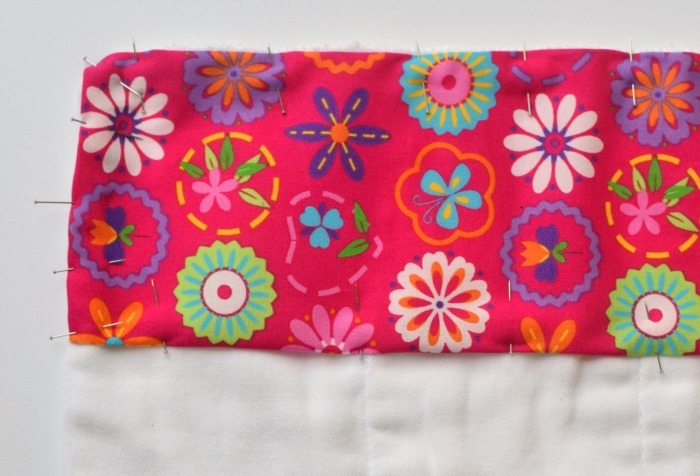 Lay one piece of material on an end of the burp cloth. Fold under the raw edges of the material. For the sides of the material that are against the edges of the burp cloth, fold the material so that the folded edge is almost flush with the burp cloth edge. Use an iron to press as you go along. Pin in place. Sew around the material close to the folded edge. No matter what color thread that you are using for the top thread, be sure that the back (bobbin) thread is white. 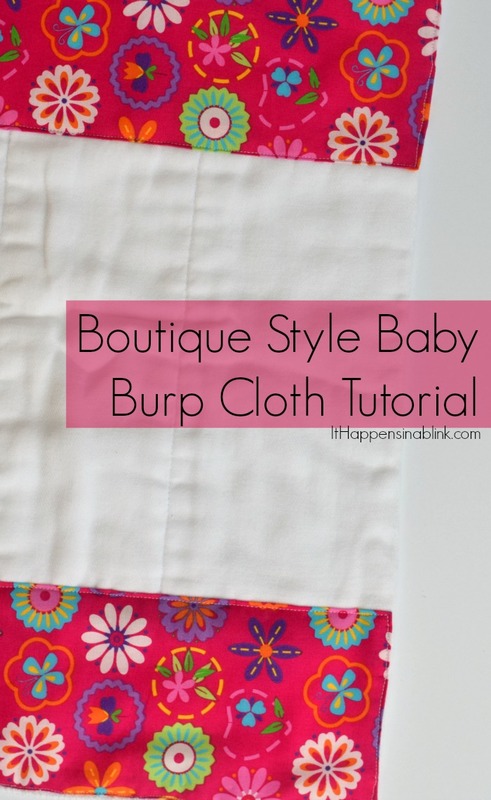 Repeat the above process on the opposite end of the burp cloth. That’s it! Wouldn’t this make a cute addition to your next baby shower gift?